Bollywood has always welcomed all the genres of movies. Of late, the silver screen has witnessed many a diverse genre. This week's release ZUBAAN is a film about dreams and aspirations and the obstacles that come in the way. Will it have a dream run at the box-office or will it succumb at the box-office, let's analyze. The film starts off with a religious song at the gurudwaara. This is followed by Dilsher (Vicky Kaushal) being bullied by some boys. When he takes resort in a construction site, he happens to meet Gurucharan Sikand (Manish Chaudhari) aka 'Lion of Gurdaspur', who happens to be a 'manager-turned-owner' of the said site. When Dilsher asks Gurucharan as to why he did not save him from the boys, pat comes the reply from Gurucharan that the only person who can save him is he himself. Saying this, he hands over a pen as a token of remembrance. Meanwhile, the sudden death of Dilsher's father puts him in a shock, thus leading him to stammer while speaking. Years later, when Dilsher grows up, he realises that Gurucharan has become an extremely successful person and that it is really tough to have a meeting with him. That's why Dilsher joins a security guards' agency in order to become one of the security personnels of Gurucharan. When Dilsher realises that his opportunities are almost bleak of meeting Gurucharan, he lands up 'creating' an opportunity to meet him. And when he meets him, he shows the pen and tells him that he also hails from the same native of Gurdaspur. In no time, Dilsher becomes extremely close to Gurucharan, so much so that he instructs Dilsher to stay with his family in their palatial house. The growing proximity between Dilsher and Gurucharan starts annoying Surya (Raaghav Chanana), so much so that he never misses an opportunity to make fun of Dilsher's 'position' in the house and his stammering disability. This is something that does not go well with Amira (Sarah Jane Dias), who happens to be the (one-sided) love of Surya. A few meetings later, Sarah Jane Dias makes Dilsher realise that he stammers only when he talks and not when he sings and that he should consider singing very seriously. Meanwhile, Dilsher, who always wanted to be as great and magnificent as Gurucharan, finds his true calling and lands up in Gurdaspurâ€¦ only to be arrested the moment he gets down the train. On the other hand, Dilsher also discovers a startling truth about his 'Godfather' Gurcharan, which shocks him extremely. Who are the people behind Dilsher's arrest, what is the secret that he discovers about Gurcharan, what is the reason for him to comeback to his hometown of Gurdaspur and does he find the 'real calling' of his life is what forms the rest of the film. The film has an extremely tight and engaging screenplay (Sumit Roy, Mozez Singh). Mozez Singh, who makes his directorial debut with ZUBAAN is definitely a name to watch out for. The ease with which he packages and delivers a sensitive film like ZUBAAN is simply exceptional. The hard work that he has put in as a director in ZUBAAN yields him rich dividends in the film. The film just does not look like being directed by a debutant director. The best part about his direction is that, places wherein any director could have either gone astray or over-the-top, Mozez Singh maintains his pace. All of this contributes in making the film a memorable affair to watch. The second half is not as watertight as the flawless first half, because, the film dips in second halfâ€¦ only to pick up pace again towards climax. The film also has many noteworthy scenes. For example, the conflict between protagonist and family (wife and son) has been shot really well. As for the performances, the film rests majorly on the shoulders of its lead cast Vicky Kaushal and Sarah Jane Dias. ZUBAAN, which happens to be Vicky Kaushal's second film (his debut being MASAAN), also sees him grow superlatively as an actor and also leaps and bounds to become the scene stealer of the film. On the other hand, Sarah Jane Dias, besides looking good, has also contributed immensely towards the film. Her performance in this film will definitely go down as one of her most memorable performances. The other actors too bring in top notch performances in the film, which helps the film's progress in a smooth manner minus any guffaws. The film also boasts of having some good music (Ashu Phatak, Ishq Bector, Shree D, Manraj Patar). Songs like 'Dhruvtara' and 'Kori Pukaar' stay with you for a long time. Rest of the songs are not that appealing, but that doesn't hamper the show. The USP of the film's music is that it has been integrated properly at the right juncture. While the film's cinematography (Swapnil Sonawane) is superlative, its editing (Deepa Bhatia) is decent. 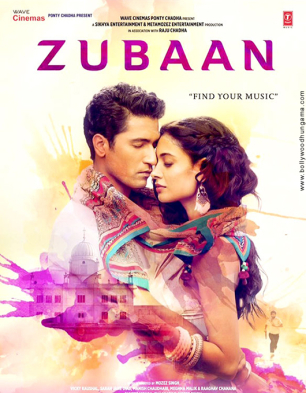 On the whole, ZUBAAN comes across as a magnificent masterpiece of the recent times. Strong performances and extremely relatable screenplay will surely bring the audiences to witness the film that speaks about love, ambition, trust, faith and betrayal.